As a child growing up in Chicago meant that when we ordered a pizza for dinner 75 percent of the time it was a deep dish pizza. I figured that was how pizza was served until I got older and realized the rest of the country doesn't normally eat deep dish pizza. Or at least not like Chicago Deep Dish. It's my favorite type to eat. I wanted to make a healthier version here at home. I decided on a Spinach and Garlic with a homemade whole wheat crust. It was quite easy to make (dough and all) It turned out great and my whole family loved it! Press dough into a greased 9x2 inch pizza pan. Layer cheese on top of the dough. Then spread on the sauce, chopped garlic, oregano, and spinach. Sprinkle Parmesan cheese over the spinach. Bake in a 425 degree oven for about 20 minutes. Enjoy! Stir the olive oil and salt into the yeast mixture, then mix in the whole wheat flour and 1 cup of the all-purpose flour until dough starts to come together. Place dough onto a surface floured with the remaining all-purpose flour, and knead until all of the flour has been absorbed, and the ball of dough becomes smooth, about 10 minutes. YUM!! Found you at Foodtastic Friday! 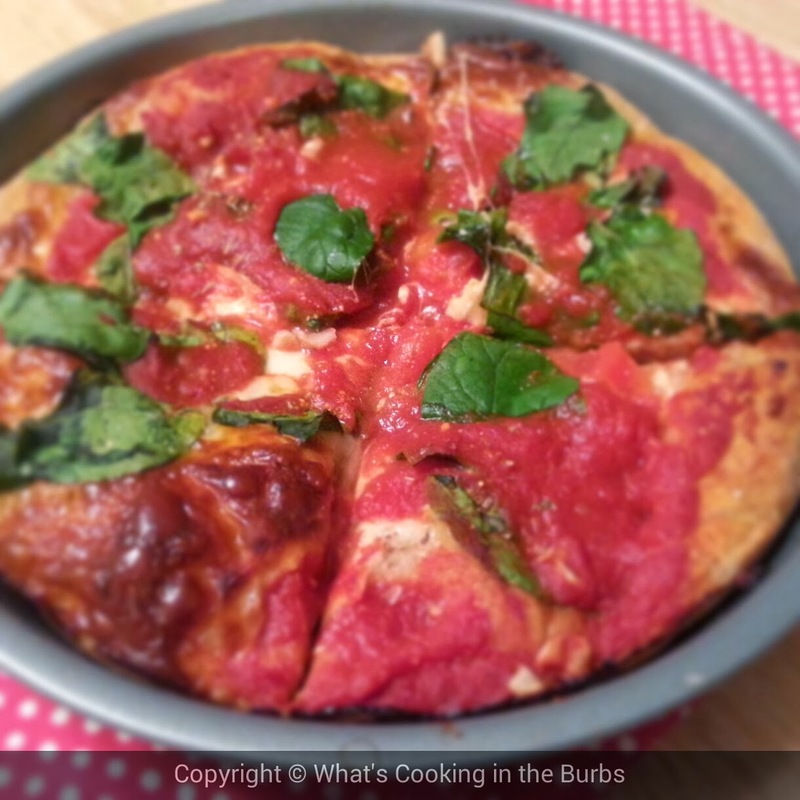 Your Deep Dish Sinach and Garlic Pizza looks amazing! Hope you are having a great week and thanks so much for sharing with Full Plate Thursday!